Click the "Month" tab on the main window. Click the "Month" command in the Go menu. Click a month name in the Year view. 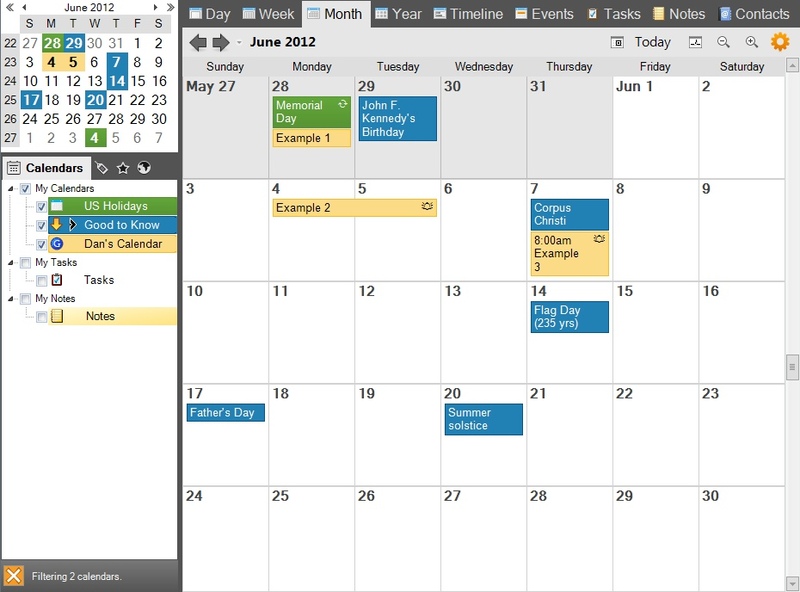 The Month View shows events, tasks, and notes for an entire month. The currently displayed month(s) will be shown at the top of the Month View, with left and right arrow buttons for navigating. The displayed range of dates can also be modified by scrolling or by selecting a different date from the Navigation Pane or any of the other views in the Calendar View. The first day of the week can be modified from the Calendar Options. Tooltips are provided when hovering over items, to quickly see the item details without having to select or open the item. When you move the cursor over an event, a tooltip will be displayed with the event's complete title, location, starting and ending dates/times, reminder status, formatted description, and even a picture thumbnail if one has been defined to display in the event's popup reminder or desktop alert. If you find the tooltips are too large for your taste, you can suppress the event descriptions from the tooltips using a Calendar Option. 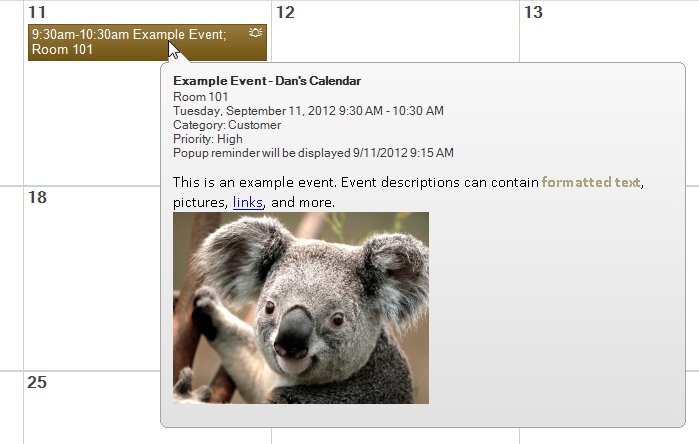 You can also click an event to select it, which will result in the event's details being displayed in the Details Pane. When using the Ultimate version, and custom data values will also be shown in the tooltip. The content of task tooltips will vary depending on the task's settings. It can include the task description, completion state, start time and duration, how often the task repeats, reminder status, and formatted details text. When using the Ultimate version, and custom data values will also be shown in the tooltip. The tooltip for a note will simply show the content of the note. The content can be anything you want, and can include pictures, links, formatted text, etc. When using the Ultimate version, and custom data values will also be shown in the tooltip. Clicking the "gear" button in the upper-right corner of the Month View will result in a menu appearing where the Month View settings can be modified. These settings can also be found under the "Month View Settings" on the Go menu. When this option is selected, the Month View will show whole months. Clicking the left and right arrow buttons to navigate between months will automatically adjust the number of displayed weeks so whole months will be displayed. The current month will also be displayed in its entirety when the program is first started, even if the current date is toward the end of the month. A specified number of weeks, between 1 and 16, can be selected for display in the Month View. This overrides the "Whole Month" option, so navigating left and right will simple move the Month View by the specified number of weeks. Also, when the program is started, the week containing the current date will be at the top of the Month View, enabling you to see upcoming dates without needing to scroll or navigate forward. When this option is enabled, Saturday and Sunday will be compressed into 1 column, instead of each having its own column. This option will allow more space for the titles of events occurring Monday through Friday, but will decrease the number of weekend events that can be displayed at the same time. When this option is enabled, each day header will show the month name in addition to the day of month number. When disabled, only the first day of the month (or the first visible day in a month) will do this, and the rest of the days will just show a number. When this option is enabled, a week header will be displayed along the left edge of the Month View. This week header can contain either a week number or the start and end dates of each week, depending whether the "Show week numbers" Calendar Option is enabled. Clicking the week header will activate the Week View. When this option is enabled, item text will be wrapped in the Month View. Note, this could result in some items no longer being visible, since more space is required when longer titles are wrapped. Use the Zoom In button to the left of the Settings button to make more space available for event titles. Item details will vary depending on how much space is available. At the minimum, the item title will appear. Depending on how large the Month View is sized, the start time and location may also appear. You can also select Low, Medium, or High detail, which show information regardless of the window size. Only item titles will be shown. Starting and ending times, locations, reminder icons, and recurrence icons will all be hidden. Item titles, starting times, reminder icons, and recurrence icons will be shown. Event locations that are 14 characters or shorter will also be shown. Item titles, starting and ending times, event locations, reminder icons, and recurrence icons will be shown. Unchecking the "View in Overlay Mode" option will result in each calendar being shown in a separate "page" of the Month view. The currently displayed calendar's name will be shown at the top of the Month view. The background color of the Month view will also change to reflect the color associated with the calendar, making it easier to tell which calendar is currently shown. In the example below, there are 3 visible calendars (US Holidays, Good to Know, and Dan's Calendar). They are initially overlaid in the same Month view, which is the default. After toggling the "View in Overlay Mode" option, the Month view is updated to only show one calendar at a time. 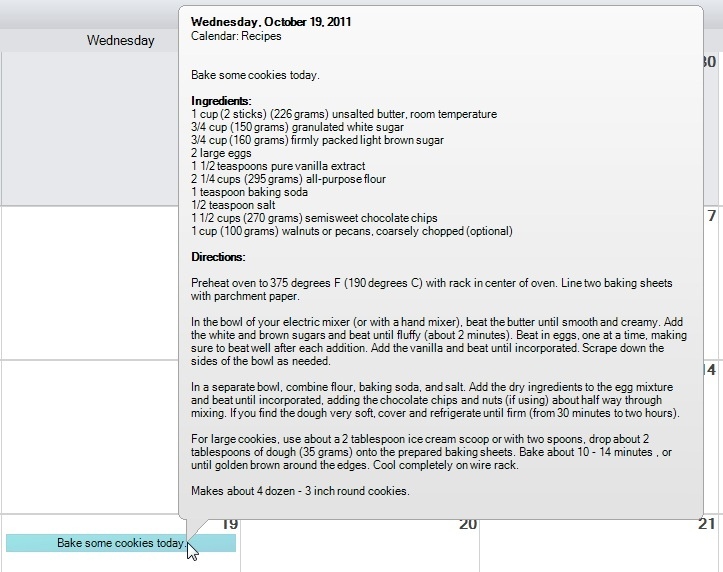 In this case, the "Good to Know" calendar is displayed. Notice how the background color is changed to a light blue, to coordinate with the dark blue color of the calendar. 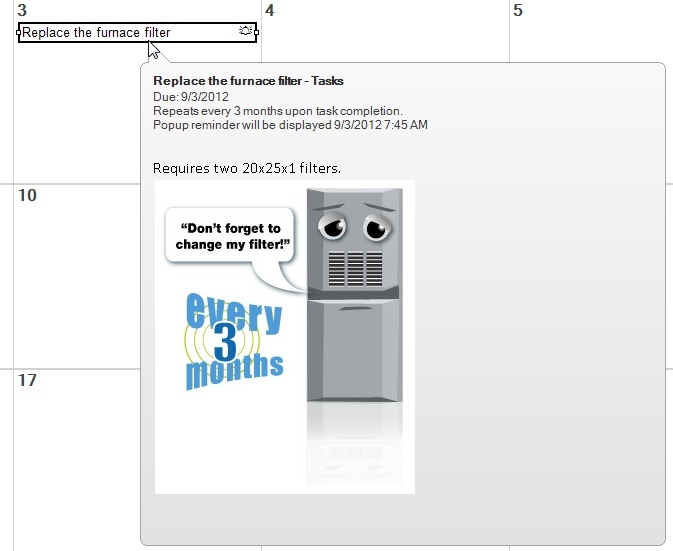 The calendar title is shown at the top of the Month view and a scroll bar is added at the bottom for switching to display the other calendars. 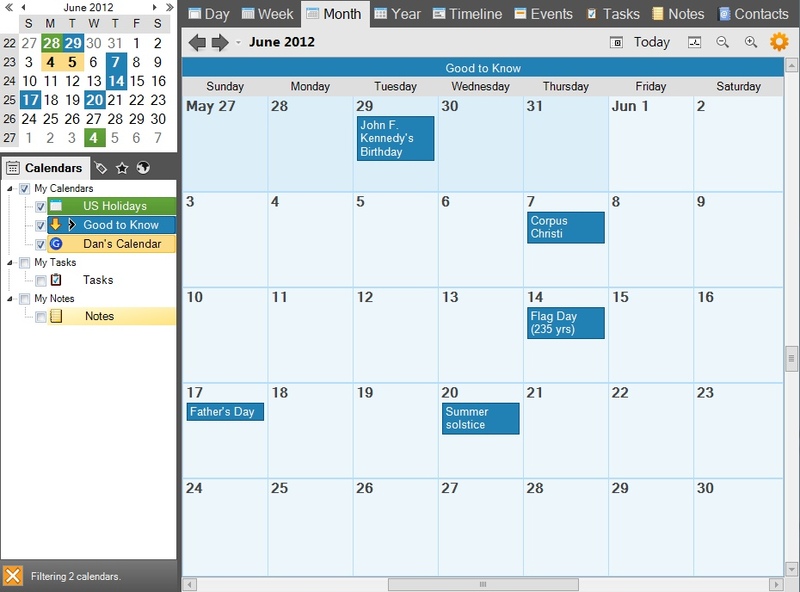 The calendar name in the list of calendars can also be clicked to make its page appear in the Month view. The "View in Overlay Mode" setting will also affect how the Monthly layout is printed. 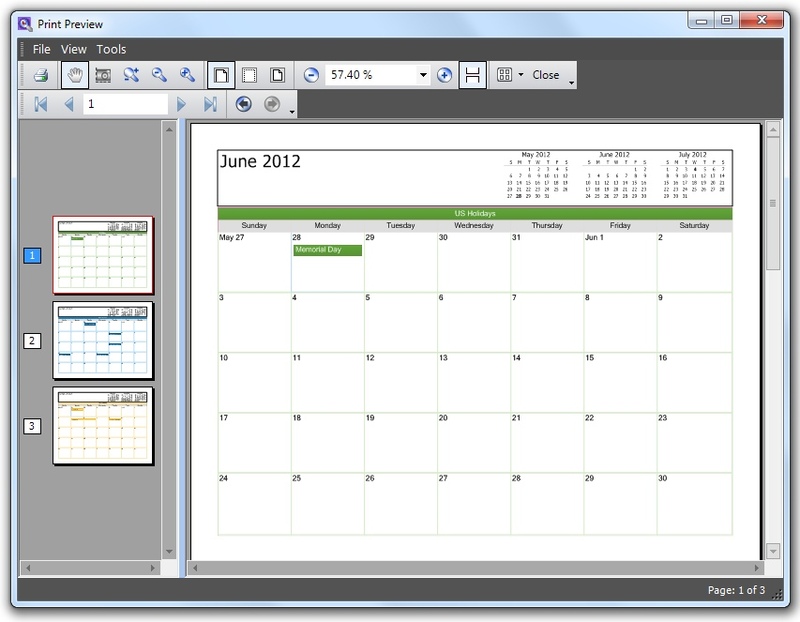 When overlay mode is disabled, each visible calendar will be printed on a separate page when using the Monthly print layout. 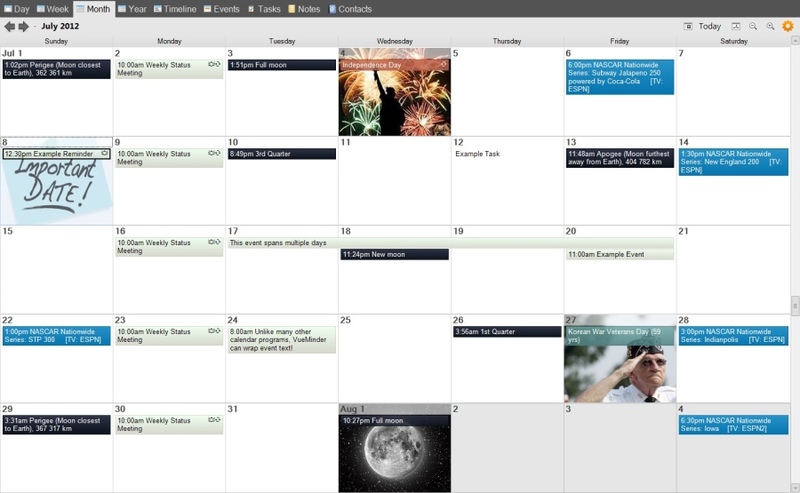 To save on ink, the background color will remain white for each calendar. However, day border colors will use the associated calendar's color. Here's how it looks in the Print Preview window. Notice how there are 3 pages, one for each calendar, even though only one month is being printed. Additional buttons are shown to the left of the settings button. From left to right, these are Today, Go to Date, Zoom Out, and Zoom In. Clicking the Today button will move the Month View to the current date. Clicking this button will increase the number of weeks simultaneously displayed in the Month View, up to 16. This is equivalent to selecting the number of weeks from the Month View Settings menu or scrolling the mouse wheel down while pressing the Ctrl key. Clicking this button will decrease the number of weeks simultaneously displayed in the Month View, down to 1. This is equivalent to selecting the number of weeks from the Month View Settings menu or scrolling the mouse wheel up while pressing the Ctrl key.